Real Salt Lake (RSL) is an American professional soccer franchise that competes as a member club of Major League Soccer (MLS) Western Conference. RSL began play in 2005 as an expansion team of the league. The club was founded in 2004 when the club's first owner and founder was awarded an expansion berth in Major League Soccer. The club plays its home games at Rio Tinto Stadium, a soccer-specific stadium located in the Salt Lake City suburb of Sandy, Utah, since 2008. RSL initially played home games at Rice-Eccles Stadium, located on the campus of the University of Utah, from 2005–2007. The team is currently led by head coach Mike Petke. In domestic soccer, Real Salt Lake won the 2009 MLS Cup and were runners-up in the 2013 MLS Cup, the Supporters Shield in 2010, and the 2013 edition of the U.S. Open Cup. The franchise regional success to date was in the 2010–11 CONCACAF Champions League, where RSL finished runners-up in the tournament becoming the first American club, since the CONCACAF Champions League format was introduced in 2008, to advance to the final stage of the tournament. The title Real (Spanish pronunciation: [reˈal]) is a Spanish word that means 'royal' in English. The term is usually used by Spanish clubs who have received royal patronage from a reigning Spanish king, the most famous of which include Real Madrid, Real Zaragoza, Real Betis and Real Sociedad. In choosing the name Real, owner Dave Checketts intended to create a brand name that would become well known for its simplicity, as well as an association with the world-famous club in Madrid that the club had been striving toward. One of the reasons for using Real was founder Dave Checketts' admiration for Real Madrid during his time as the general manager of the National Basketball Association (NBA)'s Utah Jazz franchise. Checketts also found it encouraging that Real Madrid had a basketball team as well. Local reaction to the new team's name was initially met with mixed feelings. On top of that, some thought that the name sounded contrived, and did not truly reflect the Salt Lake area, with other team names such as "Highlanders", "Salt Lake SC", or "Union SLC" being more preferred. However, by at least 2014, reaction to the name had improved, with the team establishing its identity as a representative of Salt Lake. Real Salt Lake became the twelfth MLS franchise when Major League Soccer awarded an expansion franchise on July 14, 2004, to SCP Worldwide, headed by Dave Checketts. Jason Kreis became the first player in RSL history, coming in a trade from the Dallas Burn. Other notable players that played in RSL's early years includes veterans Clint Mathis, Eddie Pope and Jeff Cunningham. RSL's first season was 2005 under head coach John Ellinger. RSL began play on April 2, 2005 against New York MetroStars at Giants Stadium, which ended in a scoreless tie. The following week, Jason Kreis scored the first goal in franchise history in a 3–1 loss to LA Galaxy at the Home Depot Center. RSL played its first-ever home match on April 16, 2005, before 25,287 fans at Rice-Eccles Stadium; Brian Dunseth scored a header in the 81st minute to deliver a 1–0 victory over the Colorado Rapids. The season was mostly a disappointment, however, with the team setting a league record by posting a 557-minute scoreless streak (later broken by Toronto FC). They were also on a 10-game losing streak before managing a 2–2 draw on the road against San Jose Earthquakes. The first season finished with a record of 5–22–5. In 2006, Real Salt Lake's second season, the team recorded five losses and one tie in the first six matches of the season. RSL had gone 18 consecutive matches without a victory—the longest winless streak in MLS history. Jeff Cunningham, who came to Salt Lake from Colorado, provided most of Real's highlights during an otherwise poor 2006 season. The team failed to qualify for the playoffs, finishing with a 10–13–9 record. Real Salt Lake boasted a formidable attack with Cunningham and Kreis up front, joined by recently signed Panamanian international Luis Tejada. They were supported by veteran talent in the midfield and defense, such as Chris Klein, Carey Talley, and newly arrived goalkeeper Nick Rimando. Their first game of the 2007 MLS season was a 2–2 draw for FC Dallas on Real's home turf. RSL were outscored 6–0 in their next three games. In a stunning move, Ellinger was fired and replaced by Kreis, who immediately retired as a player. Also, general manager Steve Pastorino resigned and was later replaced by Garth Lagerwey. The franchise launched a massive re-construction project that continued throughout the year. The team finished with a disappointing 6–15–9 record, missing the playoffs yet again. In the 2008 MLS season, working with new General Manager Garth Lagerwey, RSL added several key players including Kyle Beckerman, Robbie Findley, Javier Morales, Nat Borchers and Jamison Olave. As Real established chemistry together, they emerged as a force when playing at home. The team's home field advantage improved dramatically in with the opening in October 2008 of Rio Tinto Stadium, the new soccer-specific stadium in Sandy. Through the regular season, their home record ended at 8–1–6. Finishing 2008 with a 10–10–10 record, RSL advanced to the playoffs for the first time. RSL advanced past Chivas USA in the first round of the playoffs. The post-season ended, however, with a RSL lost to the Red Bulls in the Western Conference final. In the 2009 MLS season, RSL proved nearly invincible at home, having a 9–1–5 record in Rio Tinto Stadium, with a record-setting +23 goal differential. Real Salt Lake did not lose a league game at home since May 2009. However, the team struggled to maintain form during road games. In the final weeks of the regular season, RSL found itself in a battle for the final two spots in the MLS playoffs. However, thanks to a victory over Colorado in the final game of the regular season, RSL clinched a position in the 2009 MLS playoffs. Despite finishing with a losing record overall (11–12–7), the team was granted the last spot through a tie-breaker. Real Salt Lake went on to win the 2009 MLS Cup by defeating the Los Angeles Galaxy in the November 22 final. RSL played the L.A. Galaxy to a 1–1 tie through overtime and won the MLS Cup (5–4 on penalties). Goalkeeper Nick Rimando was named Man of the Match. The victory in the 2009 MLS Cup qualified RSL for the 2010–11 CONCACAF Champions League. The 2010 season saw RSL continue its home unbeaten streak. On October 16, 2010 Real Salt Lake improved their home unbeaten streak to 25 games after beating the FC Dallas. This win gave Real Salt Lake the most consecutive home games without a loss in MLS history. RSL tied San Jose Earthquakes 2005 record for a single-season home unbeaten streak with zero losses in the 2010 regular season. Real Salt Lake finished second in the race for the Supporters Shield with a (15–4–11) record. Goalkeeper Nick Rimando led the league with 14 shutouts, and Jámison Olave was named MLS Defender of the Year. In the MLS playoffs, however, RSL lost to FC Dallas in the first round. 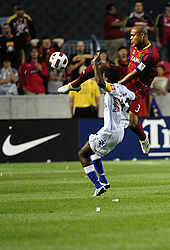 For the 2010–11 CONCACAF Champions League, Real Salt Lake were placed in Group A with Cruz Azul of Mexico, Toronto FC of Canada and Arabe Unido of Panama. Real Salt Lake finished first in Group A, with a perfect 3–0 home record and a 1–1–1 away record. RSL continued its run in the 2010–11 CONCACAF Champions League knockout rounds in spring 2011. In the quarterfinals, Real Salt Lake advanced by beating the Columbus Crew 4–1 over two games. In the semifinals, Real Salt Lake beat Saprissa 2–0 in the home leg, before losing the away leg 1–2. The 3–2 aggregate was enough for Real to advance and become the first MLS team to reach the CONCACAF Champions League finals. Real Salt Lake played the first leg of the finals at Mexican side Monterrey. RSL's Javier Morales scored in the 89th minute, ending the game in a 2–2 draw. The second leg of the final was held on April 27, 2011, at Rio Tinto Stadium; Monterrey scored the only goal of the game, giving Monterrey a 3–2 aggregate victory. In their 2011 MLS season, RSL's home unbeaten streak ended at 29 games on May 28, 2011, with their loss to the Seattle Sounders FC. Real finished the regular season with a 15–11–8 record and finished third in the western conference. In the MLS playoffs, RSL defeated Seattle Sounders 3–2 on aggregate. In the conference finals, RSL lost 3–1 to the LA Galaxy and were eliminated. RSL qualified for the 2012–13 CONCACAF Champions League, since LA had won both the 2011 MLS Cup and Supporters' Shield, and RSL had the next best record. In 2012, Real finished second in the Western conference during the regular season. In the playoffs, RSL lost to Seattle in the conference semifinals, and were eliminated from the playoffs. In the 2012–13 CONCACAF Champions League, RSL were placed in Group 2 with Herediano of Costa Rica and Tauro of Panama, but were eliminated at the group stage. In 2013, Checketts sold his stake in Real Salt Lake to minority owner Dell Loy Hansen. Before the season, the club also traded key players Jámison Olave, Fabián Espíndola and Will Johnson. RSL finished the season in second place in the Western Conference with a 16–10–8 (W-L-T) record, and reached both the Open Cup and MLS Cup finals, losing both to D.C. United and Sporting Kansas City, respectively. After the season, head coach Jason Kreis left Real Salt Lake to become the first head coach of expansion club New York City FC, with long-time assistant coach Jeff Cassar replacing him at the helm. Despite the departure, the club finished the 2014 season in third in the Western Conference, with a record of 15–8–11 totaling 56 points, and qualified for the 2015-16 CONCACAF Champions League. In the MLS Cup Playoffs, RSL was eliminated in the conference semifinals by eventual champions LA Galaxy 5–0 on aggregate. Despite a five-game unbeaten start to the 2015 season, the team eventually began to struggle in the standings, coupled with a loss to Sporting Kansas City in the semi-finals of the 2015 Open Cup. RSL also lost key player Nat Borchers, who they traded to the Portland Timbers before the season and all-time goalscorer Álvaro Saborío, traded away to D.C. United mid-season. Although late-season signings Luis Silva and Juan Manuel Martinez provided strong performances, the team did not qualify for the playoffs for the first time since 2007. The 2016 season started with the Quarterfinals on the 2015–16 CONCACAF Champions League where they were eliminated by eventual runner up Tigres UANL of Liga MX by an aggregate score of 3–1. The 2016 season saw Real Salt Lake return to the playoffs but they were once again eliminated by the LA Galaxy, this time by a 3–1 score line on the road in the Western Conference play in game. In the off season, longtime legends Javier Morales and Jamison Olave did not have their options exercised by the club. On March 20, 2017 the club announced that head coach Jeff Cassar had been dismissed from his duties only three games into the season. Daryl Shore was named interim head coach for the two games against the New York Red Bulls and Minnesota United. On March 29 it was announced that Mike Petke would take over the head coaching position following the game against Minnesota United on April 1. Despite a dazzling late season run, the team finished one point shy of making the playoffs. The 2018 season was heralded with the opening of the new $78 million Training Center and Zion's Bank Real Academy in Herriman, Utah. The facility was praised for offering world-class training amenities year round for Real Salt Lake and the organization's other teams the NWSL's Utah Royals FC and the men's second division side Real Monarchs. It also houses the team's youth academy, which was moved from Casa Grande, Arizona, offering a single location and clear path for acquiring and developing young talent. The team's official colors are claret red, cobalt blue, and real gold. Home, away, and third uniforms. Rio Tinto Stadium has been RSL's home stadium since 2008. In 2005 a soccer-specific stadium was approved for Sandy, a suburb of Salt Lake City. However, a vote in 2006 struck down a funding proposal. Dave Checketts said that he would sell it if a proposal was not put forward. Parties from several cities, including Rochester, New York and St. Louis, Missouri, expressed interest in purchasing the franchise and moving it. Finally, after months of discussions an agreement was put in place and Real Salt Lake announced that they would move forward with the construction of Real Salt Lake Stadium. The Debt Review Committee of Salt Lake County, however, voted against the stadium. In response, Real Salt Lake's owner announced the team would be sold and likely move out of the Salt Lake area after the 2007 season. However, a new stadium proposal was passed by the State Senate. The Utah House approved House bill 1SHB38, approving $35 million towards the development of Real Salt Lake's new home. The governor signed the bill. The $110 million stadium was built in Sandy, a suburb of Salt Lake City. The stadium was named after its sponsor, Rio Tinto Group. The stadium's opening date was set for October 9, 2008. Only regular-season matches played with Real Salt Lake in Utah counted towards records. Real Monarchs – compete in the USL, the second division men's professional league in the United States. Utah Royals FC – compete in the NWSL, the first division women's professional league in the United States. The main rival of Real Salt Lake is considered to be the Colorado Rapids, with the two teams being the closest to each other geographically, and also competing for the annual Rocky Mountain Cup. Competition first began upon Salt Lake's entry into Major League Soccer in 2005, with the cup itself being awarded by a bi-partisan "Committee of 10", made up of fans from each respective club. Although dominated by the Rapids early on, Salt Lake has since taken a 9–4 series lead over their rivals, and are the current holders of the cup, having won it during the 2017 season. Although no annual trophy is involved, since 2011, the more fierce rival has become Sporting Kansas City, which was born out of a 2011 preseason brawl, and culminated in a physical RSL defeat in the 2013 MLS Cup after a penalty shootout. Since that time, the teams have regularly competed for supremacy at the top of the Western Conference, and even during Real Salt Lake's rebuilding years, have faced off in many heated exchanges. The team also maintains smaller, fan-driven rivalries with both Los Angeles based teams and Seattle Sounders FC. The latter is derived from their meeting in the 2012 MLS Cup Playoffs and due to Seattle prying away Garth Lagerway, the general manager who built the roster of the team's Golden Years in 2014. Real Salt Lake has six official supporters groups, which as of 2019 all exist under a larger unified umbrella group known as The Riot who are primarily seated in sections 35 and 26 in the south stands. Leo the Lion is the official mascot of Real Salt Lake. In 2011, Branden Steineckert, drummer of punk band Rancid and a supporter of Real Salt Lake, composed the song "Believe" in honor of the club. Initially posted on YouTube, the song has since been adopted as the team's official anthem, being sung at the beginning of every home game, as well as after all goals scored by RSL. As Real Salt Lake is a small-market team, one of the team's biggest challenges is bringing in enough revenue to remain competitive. Opening Rio Tinto Stadium in October 2008 provided a significant revenue boost to the team. Real Salt Lake went from 4,000 season-ticket holders before October 2008, to 8,750 in 2012, 10,000 in 2013, and 15,000+ in 2016. RSL has a multimillion-dollar sponsorship deal with LifeVantage. It previously had a multimillion-dollar deal with XanGo a nutritional supplements company based in Utah, to carry the XanGo logo on the front of RSL jerseys from the 2007 season until 2014. Additional sponsors include JetBlue Airways and Maverik, Inc.
Radio broadcasts air on KALL AM 700 (English) and KTUB AM 1600 (Spanish). As of the 2015 season, Sinclair Broadcast Group holds television rights to Real Salt Lake games that are not aired by Major League Soccer's national television partners. The telecasts feature pre- and post-game coverage. Sinclair's Utah stations KUTV and KMYU serve as the team's flagship stations, and telecasts are syndicated to other Sinclair-owned stations in the region, and non-Sinclair stations in Albuquerque, Phoenix and Tucson. In 2018, the team extended its television deal with Sinclair, and announced a streaming partnership with KSL-TV, under which it will offer in-market streaming of RSL's regional broadcasts, as well as Utah Royals FC and Real Monarchs matches, on digital platforms. For details on former players, see All-time Real Salt Lake roster. Includes MLS regular Season, MLS Playoffs, CONCACAF Champions League, and Lamar Hunt U.S. Open Cup. RSL won the 2009 MLS Cup by defeating the LA Galaxy 5–4 on penalty kicks. RSL lost the 2013 MLS Cup final to Sporting Kansas City 6–7 on penalty kicks. Games decided by a PK Shoot out counted as win or loss not Draw. The reserve team of Real Salt Lake, named Real Monarchs SLC, was created on September 10, 2014 as a bridge between the club's academy program and the first level team. The team began play in the Western Conference of the United Soccer League during the 2015 season, playing their home games at Rio Tinto Stadium along with their parent team. Starting in 2018, the Monarchs will move to Zions Bank Stadium, a 5,000-seat facility located at RSL's new training center in Herriman. A women's soccer team, called Real Salt Lake Women, was founded in 2008. The team is currently a member of the Western Division of United Women's Soccer, the second tier of women's soccer in the United States and Canada, and plays its home games at Ute Field, on the campus of the University of Utah in Salt Lake City. Real Salt Lake added a second women's team, this one in the top-level National Women's Soccer League, in November 2017. This team effectively replaced FC Kansas City in the NWSL, as FC Kansas City soon folded and all of its player contracts were assigned to the new RSL franchise. Shortly thereafter, the new team, which will share Rio Tinto Stadium, was unveiled as Utah Royals FC. Only regular season matches played with Real Salt Lake counted towards all-time records. Stats from MLS play offs, U.S. Open Cup, Super Liga and CONCACAF Champions league are not included. Only regular season matches played with Real Salt Lake counted towards records. Players in bold currently play for Real Salt Lake. The annual season-ending award winners are decided based on voting by RSL players. ^ "Real Salt Lake History". MLSSoccer.com. MLS Digital. Retrieved November 19, 2015. ^ "Real Salt Lake 2012 Media Guide" (PDF). Major League Soccer. March 5, 2012. Archived from the original (PDF) on June 1, 2012. Retrieved March 21, 2017. ^ "The Real Story: Madrid to Salt Lake City". The New York Times. Retrieved February 21, 2015. ^ West, Phil (April 28, 2016). "How Real Salt Lake got their name and colors". Major League Soccer. Retrieved May 19, 2016. ^ Richins, Peter (August 6, 2004). "Major League Soccer: Looking for a nickname". The Salt Lake Tribune. Retrieved November 19, 2015. ^ "The Absurdity of MLS Nomenclature". Retrieved November 2, 2014. ^ "A New Day for Real Salt Lake as Dave Checketts moves on". RSL Perspective. January 24, 2013. Retrieved June 8, 2014. ^ "USSoccerPlayers: Sounders Already Scoring". Ussoccerplayers.typepad.com. April 10, 2008. Archived from the original on October 4, 2011. Retrieved December 3, 2011. ^ Dicker, Ron (April 3, 2005). "On a Night Unfit for Scoring, the MetroStars Slog to a tie". The New York Times. ^ Dan Rasmussen (October 5, 2008). "Real Salt Lake: Things have changed a lot since '05 opener". DeseretNews.com. Retrieved February 21, 2015. ^ James Edward (August 8, 2007). "'Tireless' Ellinger setting sails". DeseretNews.com. Retrieved February 21, 2015. ^ "Winless RSL has coaching shake up". ESPN. September 1, 2011. Retrieved September 1, 2011. ^ James Edward (October 25, 2009). "Real Salt Lake: Believe it! RSL earns playoff spot". DeseretNews.com. Retrieved February 21, 2015. ^ "Salt Lake beat L.A. Galaxy to MLS title". ESPN. November 23, 2009. Retrieved November 23, 2009. ^ "RSL Notes & Quotes – RSL 2 : 0 FCD". Real Salt Lake. Retrieved February 21, 2015. ^ Lewis, Michael C. (October 20, 2010). "Brazilian's two goals propel RSL over Cruz Azul". The Salt Lake Tribune. Retrieved November 19, 2015. ^ "Real Salt Lake, Club World Champions?". usdish.com. Retrieved April 26, 2011. ^ Edward, James (May 28, 2011). "Sounders end RSL's 29-game home unbeaten streak". Deseret News. Retrieved November 19, 2015. ^ "LA's victory over NY guarantees CCL berth for RSL". MLSsoccer.com. Retrieved February 21, 2015. ^ "CCL Recap: Herediano hold RSL 0–0, dash CCL dream". MLSsoccer.com. Retrieved February 21, 2015. ^ Nicholas Rosano (January 24, 2013). "Dell Loy Hansen acquires full ownership of Real Salt Lake". Retrieved April 14, 2013. ^ Michael Black (February 27, 2013). "2013 Real Salt Lake Preview: Revamp–not overhaul–should keep RSL in the hunt". Retrieved April 14, 2013. ^ "Jason Kreis steps down as head coach of Real Salt Lake, will take top job at New York City FC". MLSsoccer.com. Retrieved February 21, 2015. ^ "Real Salt Lake promote longtime assistant Jeff Cassar to replace departed head coach Jason Kreis". MLSsoccer.com. Retrieved February 21, 2015. ^ "Sporting KC 3–1 Real Salt Lake". sportingkc.com. Retrieved October 23, 2015. ^ Kamrani, Chris (December 8, 2014). "Done deal: RSL trades Nat Borchers to Portland in exchange for allocation money". The Salt Lake Tribune. Retrieved November 19, 2015. ^ Kamrani, Christopher (July 16, 2015). "Real Salt Lake: RSL trades Alvaro Saborio for D.C. United midfielder Luis Silva (with video)". The Salt Lake Tribune. Retrieved November 19, 2015. ^ "Real Salt Lake Exercises Options on Five Players". Real Salt Lake. November 30, 2016. Retrieved March 30, 2017. ^ "Real Salt Lake Dismisses Head Coach Jeff Cassar". Real Salt Lake. March 20, 2017. Retrieved March 21, 2017. ^ "Real Salt Lake promote Mike Petke to Head Coach". Real Salt Lake. March 29, 2017. Retrieved March 30, 2017. ^ Lee, Maddie (February 28, 2018). "MLS commissioner says Real Salt Lake's new facility enables the league to recruit, develop world's top talent". The Salt Lake Tribune. Retrieved August 22, 2018. ^ Halpin, Jeff. "Introducing Utah's team: Real Salt Lake". Major League Soccer. Archived from the original on August 19, 2007. Retrieved June 9, 2015. ^ "Real Salt Lake jerseys through the years " claretpapers". Claretpapers.wordpress.com. Retrieved September 2, 2012. ^ "RSL kit unveil: Gold bar features crown, reaction mixed". RSL Soapbox. Retrieved November 2, 2014. ^ Borg, Simon (March 4, 2014). "Jersey Week 2014: Real Salt Lake's new home kits carry club's motto". Major League Soccer. Retrieved June 13, 2015. ^ "Real Salt Lake joined by Real Madrid Saturday at 12:00 noon to break ground on Sandy stadium site". Major League Soccer. January 23, 2010. Retrieved June 9, 2015. ^ "Soccer Stadium Finally A ReALity". KUTV. Associated Press. August 15, 2006. Archived from the original on September 26, 2007. Retrieved June 13, 2015. ^ "KSL Newsradio: Soccer stadium deal is dead". Deseret News. January 29, 2007. Retrieved December 3, 2011. ^ Jensen, Derek P. (February 2, 2007). "Stadium plan: It's ba-a-ack!". The Salt Lake Tribune. Retrieved December 3, 2011. ^ Lisa Riley Roche; Amelia Nielson-Stowell; Leigh Dethman (February 3, 2007). "Stadium deal due by Friday — or else". Deseret News. Retrieved December 3, 2011. ^ Walsh, Rebecca (February 6, 2007). "Senate paves way for a Sandy stadium". The Salt Lake Tribune. Archived from the original on February 6, 2012. Retrieved December 3, 2011. ^ "RSL confirms Oct. 9 stadium opening". The Salt Lake Tribune. August 5, 2008. Archived from the original on September 30, 2008. Retrieved November 19, 2015. ^ "Home sweet home: The longest home unbeaten runs in MLS history". mlssoccer.com. Retrieved August 6, 2016. ^ "SCHEDULE". rsl.com. Retrieved August 6, 2016. ^ "The History of the Rocky Mountain Cup". SB Nation. June 4, 2015. Retrieved September 29, 2015. ^ MLSsoccer Staff (April 28, 2017). "Hard tackles, hard words, hard-fought: The Real Salt Lake-Sporting KC feud". MLSsoccer.com. Retrieved July 14, 2018. ^ Kamrani, Christopher (June 21, 2015). "Real Salt Lake: Heated rivalry with Sporting KC still alive and well". The Salt Lake Tribune. Retrieved November 19, 2015. ^ RSL Communications (July 5, 2018). "Real Salt Lake Explodes for 4–2 Win Over Sporting Kansas City". RSL.com. Retrieved July 14, 2018. ^ "Garth Lagerway". soundersfc.com. Retrieved July 14, 2018. ^ "Supporters Groups". RSL.com. July 2018. ^ "Leonardo the Lion". RSL.com. ^ a b Botta, Christopher (March 4, 2013). "MLS club presidents on the season ahead". Sports Business Daily. Retrieved June 9, 2015. ^ "Behind the MLS Ambition Rankings: Real Salt Lake". SI.com. March 4, 2016. Retrieved July 14, 2018. ^ Harvey, Tom (November 22, 2013). "RSL to switch jersey sponsor". The Salt Lake Tribune. Retrieved November 19, 2015. ^ "Real Salt Lake unveils new long-term jersey-front partnership with LifeVantage". RealSaltLake.com. October 29, 2013. Retrieved October 29, 2013. ^ James Edward (March 19, 2009). "Real Salt Lake signs JetBlue as airline partner". Deseret News. Retrieved November 2, 2014. ^ "Royal Partners". Real Salt Lake. Retrieved November 2, 2014. ^ "Real Salt Lake close TV deal that would provide "quantum leap" in market reach". Real Salt Lake. Retrieved February 21, 2015. ^ Komma, Matt. "Real Salt Lake extends Partnership with KMYU". KUTV.com. Sinclair Broadcast Group. Retrieved March 3, 2018. ^ "Real Salt Lake launches innovative local streaming partnership with KSL". February 12, 2018. Retrieved March 3, 2018. ^ Morton, Aaron (February 13, 2018). "KSL to stream nearly all Real Salt Lake, Utah Royals and Monarchs games". DeseretNews.com. Retrieved March 3, 2018. ^ "Real Salt Lake official roster". Real Salt Lake. ^ "Real Salt Lake Signs GK Alex Horwath". Real Salt Lake. ^ Edward, James (July 2, 2011). "Real Salt Lake: Jason Kreis has altered the course of team history". Deseret News. Retrieved June 22, 2018. ^ "Standings". MLSSoccer.com. MLS Digital. Retrieved August 22, 2018. ^ a b c d e f Record was set in the 2010 season. ^ Randy Davis (December 19, 2010). "The numbers behind RSL's record-setting season". Real Salt Lake. Retrieved December 3, 2011. ^ "Zions Bank Real Academy new home for Real Salt Lake development pyramid" (Press release). Real Salt Lake. May 24, 2017. Retrieved December 19, 2017. ^ "Real Salt Lake to field NWSL team starting in 2018" (Press release). Major League Soccer. November 16, 2017. Retrieved December 19, 2017. ^ Torres, Maria (November 20, 2017). "FC Kansas City women's soccer team folds, NWSL sends players to Salt Lake City". The Kansas City Star. Retrieved December 19, 2017. ^ "Utah Royals FC unveils name, identity for 2018 NWSL season" (Press release). Real Salt Lake. December 1, 2017. Retrieved December 19, 2017. ^ "Player Registry – MLS". Real Salt Lake. Retrieved August 24, 2017. ^ "Major League Soccer Season Statistics – Real Salt Lake". Real Salt Lake. Retrieved September 2, 2017. ^ "Real Salt Lake Announces 2017 Award Winners". rsl.com. Retrieved October 25, 2017. Wikimedia Commons has media related to Real Salt Lake. This page was last edited on 16 April 2019, at 23:42 (UTC).